In many ways, Griffin Martel is like a lot of other 12 year-olds. He likes to be included in activities with his family and peers at school. He is animated by conversations, and moved by upbeat music. However, Griffin and his family have also experienced hardships not typical of many kids. At the age of one, Griffin was transferred from BC Children’s Hospital to Canuck Place Children’s Hospice for end-of-life care. He had been experiencing an increase in seizures and episodes of apnea. The specialized clinical care team of nurses and physicians at Canuck Place helped manage these episodes and Griffin was able to regain some strength and become more aware of the world around him. Today, ten years later, Griffin and his family now make Canuck Place their home away from home with regular medical respite stays. Griffin’s siblings, Nicole, 13, and Spencer, 7, love attending school at Canuck Place. Griffin’s parents, Alysone and Warren, have been supported and empowered by the program to help in Griffin’s care. Last summer, Griffin participated in the Canuck Place Adventure Race – a multi-sport fundraising event for Canuck Place. 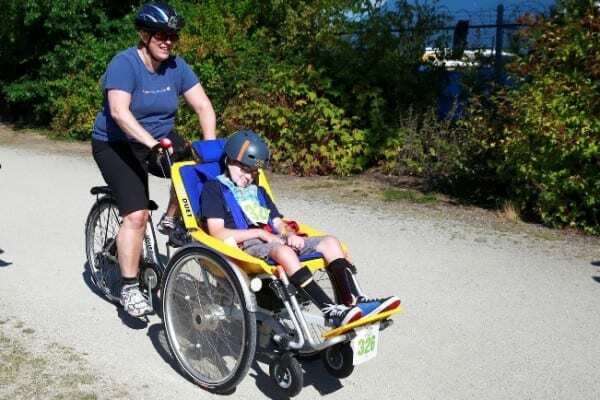 Griffin, who requires a wheelchair for mobility, was able to join the other kids through an adaptive route specially designed for Canuck Place kids, which included access to an adapted bike.